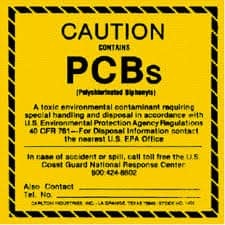 [sc:date] Polychlorinated Biphenyl (PCB) is a class of toxic chemicals used in the production electrical insulators, capacitors, refrigerators and other types of electrical equipment. Due to its negative impact on both human health and the environment, the federal government placed a strict ban on its use. It wasn’t until the late 1970s when the ban was lifted, allowing companies to use PCBs under strict guidelines set forth by the EPA. Enacted on October 11, 1976, The The Toxic Substances Control Act (TSCA) is designed to secure information on both new and old PCBs as well as other toxic chemicals. Companies are required by law to mark and label chemicals such as these to reduce the chance of an accidental spill or environmental contamination. For a more detailed explanation of the TSCA, please visit the official EPA page located here. It’s important to note, however, that some states may have their own set of rules and regulations to compliment the efforts of the TSCA. In addition to placing a mark on all of the items previously mentioned, the TSCA also states that companies must place a label with the “date removed from service” on disposed items containing PCB or PCB-contaminated equipment. This is the date when the item in question was disconnected from the electrical system and not the date when the item was physically disposed of or thrown away. Labeling and marking PCBs isn’t an overly difficult process, but it’s necessary to create a safe and compliant work environment. Hopefully, this post will give you a better understanding of PCB and how to properly label them.